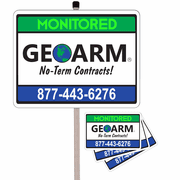 Security Yard Signs & Stickers for the DIYer! 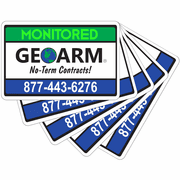 GeoArm security signs and stickers alert would be intruders that your home or business is protected 24/7/365 by our nationwide central alarm monitoring station. 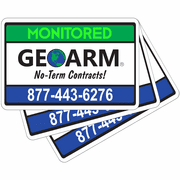 Security signs and stickers are the first deterrent against a potential robbery. 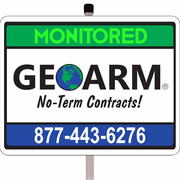 Did you know that a GeoArm monitored home alarm system can save homeowners hundreds of dollars a year off their home insurance premium? 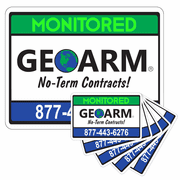 Simply put, criminals are less likely to strike when they know they will be caught. 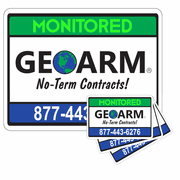 So make your home or business safer and less likely to be targeted for criminal activities by displaying GeoArm's brand image around your property. 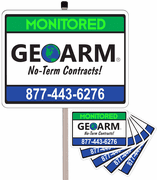 Our security signs and stickers are attractive and durable. 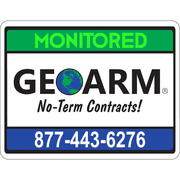 Along with signs and stickers being the first deterrent, you can also check out other GeoArm recommended security tips that are proven to help deter crime.